Every year there are some great events in London at Christmas that don't quite fit into another category. These events range from the unusual (Serpentine Swimming) to the silly (Santa Run) to the charitable (Crisis Christmas). You can join in many of them, so why not do something a little different for once? Santas On The Run - Walk or run through London for charity... dressed as Santa. They provide the costume! One of the many great things to do at Christmas in London. Christmas Tree Lighting Ceremony Each year since 1947 the people of Norway have given a 50-60 year old Christmas tree to the people of London in gratitude for Britain's support for Norway during World War II. The people of Oslo refer to the tree as 'the Queen of the Forest'. It is normally erected in December. The Great Christmas Pudding Race - Covent Garden, December. The Great Christmas Pudding Race has been held for over 30 years, where teams of 6, wearing fancy dress, take on an obstacle course while trying to balance a Christmas pudding on a tray. Anyone can watch, but the most fun is had if you sign up and take part. 5K Santa Run - December. In Greenwich Park, London. 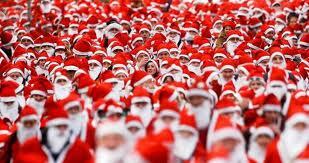 1000s of entrants, and a free Santa suit for all runners! Crisis Christmas - need 6,500 volunteers to help their Christmas centres. Based in London, from 23 - 30 December, it supports over 2000 homeless and vulnerable people. A very worthwhile charity. If you know of other unusual events or things to do at Christmas, please submit the event.